KAWAMURA Misako (1944-) Ceramic artist. Born in Shiga Prefecture. Currently resides in Shiki City, Saitama Prefecture. Her works have a keynote of blue and neriage rose patterns. 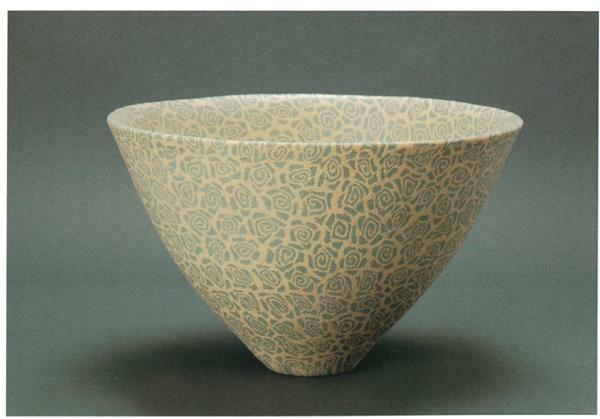 After receiving a Yomiuri Shimbunsha award at the Saitama Ceramic Art Exhibition in 1987, works were selected for Japan Traditional Crafts New Works Exhibition and she won many awards at exhibitions such as Saitama Women’s Ceramic Art Exhibition, National Ceramic Art Exhibition, and the Ceramic Art Foundation Exhibition. Major awards received include the Minister of Education, Culture, Sports, Science and Technology Award at the 1996 Saitama Ceramic Art Exhibition and the Prime Minister’s Award at the Ceramic Art Foundation Exhibition. She has held 4 personal exhibitions, and recently held a personal exhibition at Shiki Gallery space M in 2006. Currently vice-chairperson of the Ceramic Art Foundation. Judge for the Ceramic Art Foundation’s exhibition. Vice-representative of Nihon Togei Kyoshitsu Renmei. Commissioned by the Saitama Joryu Kogei Sakka Kyokai. Member of Saitama Artists Society. Member of the operating committee of Shiki Art Association. Neriage flower-patterned basin. 36×36×23. Exhibited at the 2012 Ceramic Art Foundation Exhibition.